The crowd packs the St. John Legislature Annex for Sen. Smith’s town hall on Caneel Bay Resort. Issues related to conservation and the V.I. 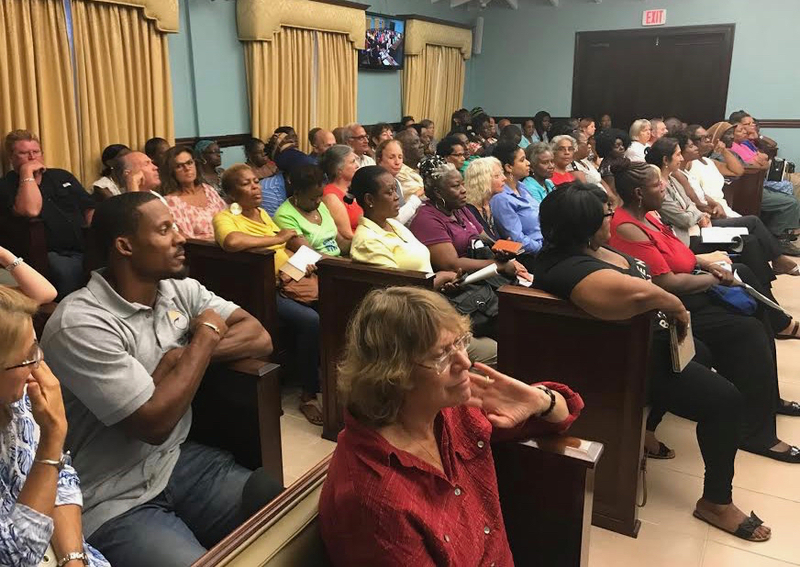 economy have figured heavily into community debates about Caneel Bay Resort’s unsure future, but at a packed town hall meeting on St. John Monday, another topic predominated: the treatment of the resort’s employees. 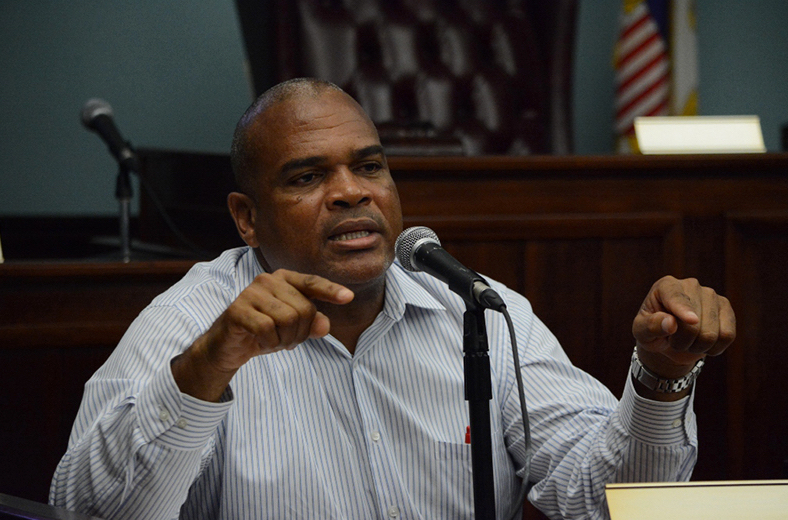 The meeting was called by Senator at-large Brian Smith, in-part for St. John residents to voice their opinions about ownership and management at Caneel, the subject of a bill moving through Congress. The bill, HR 4731, was introduced by Delegate Stacey Plaskett in December with no public meeting held on St. John. It proposes a 60-year extension of the agreement between Caneel’s owners and the National Park Service, allowing the resort to operate on park land. The bill also introduces a market value rent to be paid to the federal government. The resort’s owners, CBI Acquisitions, say they need the six-decade extension proposed by Plaskett’s bill to justify investing in the resort’s rebuild after Hurricanes Irma and Maria. 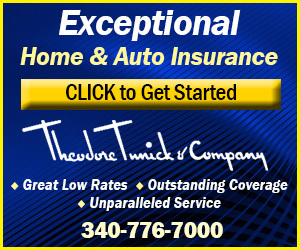 That rebuild, the company says, could cost up to $100 million, although the bulk of that sum is expected to be covered by insurance claims. The agreement the resort operates under, a retained use estate set to expire in 2023, is atypical, and dates to resort founder Laurance Rockefeller’s donation of the land to the park in 1983. Critics of the agreement say it is not restrictive enough for a business operating on public land, although a 1986 amendment does place some restrictions on the resort, including the height of buildings that can be constructed on the property. CBI, which purchased the retained use estate from Deutsche Bank in 2004, say that nearly a decade of attempts to negotiate a more typical lease with the National Park has left them frustrated by a slow bureaucratic process. The devastation of September’s storms, both to the resort and to the V.I. economy, has made the issue of the soon-to-expire RUE more complicated and more urgent, according to CBI and Plaskett. 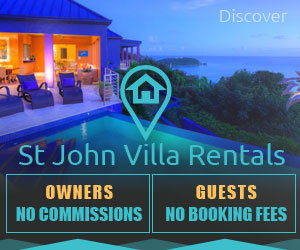 The resort typically contributes approximately $65 million to the St. John economy, and employs hundreds. According to Caneel’s executive director Brad Dow, in 2016 Caneel had 334 employees, and an additional 112 people were working at the resort’s concessions, including ZoZo’s restaurant. 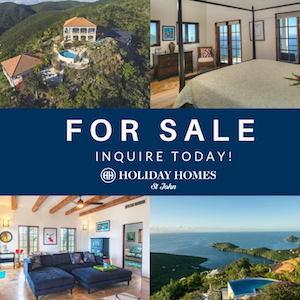 When September’s hurricanes struck, there were 161 St. John residents employed by the resort, 180 St. Thomas residents, and 6 employees in the hotel’s New York sales office. There are currently 16 employees working at Caneel. Dow said about 35 of the resort’s 166 rooms are habitable and are mostly being used to house disaster relief workers. Although Plaskett has met with community, media and government representatives regarding her bill – which has sparked much debate on St. John – she has yet to host or appear at a public meeting on the issue of Caneel, and she did not attend Sen. Smith’s town hall Monday. Also absent was any public comment from the National Park Service. Many who spoke Monday night said they don’t feel like that has been happening, prior to September’s storms or afterwards. Long-term and generational employees of Caneel said jobs at the resort have become more insecure, especially since CBI is the first owner to layoff a bulk of its employees every year during St. John’s slowest tourism months. Most hotels in the territory reduce employee hours in the summer, and most – like Caneel – receive local tax breaks partly in exchange for offering secure, full-time jobs to residents. But Caneel’s yearly mass layoffs are atypical. Brummell Germain, a St. John resident whose parents worked at Caneel for more than 30 years, was the first person at the meeting to speak on the issue of employee treatment. When he did there was audible encouragement from the crowd. “Moving into a situation where we are trying to renew a lease with the resort, the question is what steps are we taking to assure there’s going to be better treatment – some training or whatever it takes – for there to be better management?” Germain said. Germain asked Dudley what specifically made him think things were going to change. But when Germain asked if CBI was going to change its off-season layoff practices, Dudley responded that he did not know. Some who spoke at the town hall suggested Caneel’s tax breaks from the Economic Development Commission should be reexamined in light of the layoffs. “What it seems like to me is that Caneel Bay may not be in compliance,” said senator at-large candidate Angel Bolques. Dudley countered that Economic Development Authority audits, the most recent one conducted in 2016, have never found the resort to be out of compliance with its contract with the V.I. Government. Bolques, whose mother is a former Caneel employee, echoed a consensus among the speakers at the town hall when he said the depth of employee grievances seems to be relatively recent, and have increased under CBI’s ownership. “The employees seem to be very disgruntled and upset,” he said. Commissioner of Labor Catherine Hendry, who attended the meeting, acknowledged that a “family relationship between management and employees” appears to have broken down. Agnes Louis, a 30-year employee of Caneel, said she and many of her coworkers felt they were dealt with impersonally by CBI after the major disasters of the 2017. After receiving termination letters, non-union employees received severance packages totaling $580,000. Severance for union-employees is still being negotiated. The resort also organized a gofundme charity that collected more than $400,000 for employees, mostly paid by former guests of the hotel. Other issues raised at Monday’s town hall included a desire by some community members, including park advocacy group Friends of the Virgin Islands National Park, for lease negotiations to resume between CBI and the NPS, in place of a congressional extension. 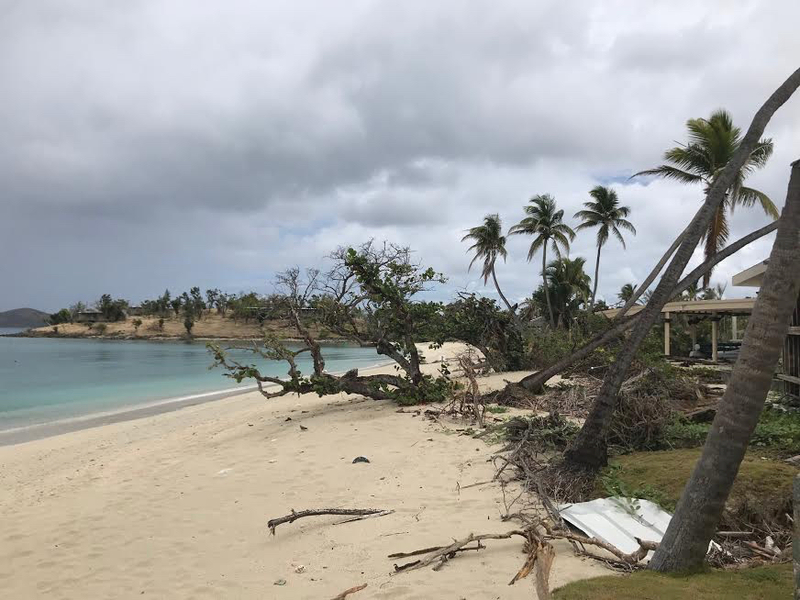 Sharon Coldren, president of the Coral Bay Community Council, called it “worrisome” that a proposal that would have ensured Caneel’s rent go towards funding local park operations now appears to be off the table. The current bill proposes to deposit Caneel’s rent in the general U.S. Treasury. Dow said that aspect of the agreement was formulated at the federal government level, and is counter to the resort’s wishes. CBI has not publicly expressed interest in returning to lease negotiations. On Monday, Dow said if the RUE extension is not granted, CBI will likely decide to close out the last five years of its current agreement as a much smaller property. That could mean as few as 30 to 50 rooms until 2023, at which point the resort would transfer to NPS property and likely go out for bid as a concession. “CBI is looking at a downsized property if nothing happens to get the extension,” Dow said. Although CBI principle Gary Engle did not attend Monday’s meeting, he was on-island as recently as a week prior to it. During an invite-only tour of the damaged resort, Engle told the Source that CBI has no plans to drastically expand the Caneel’s current footprint at 166 rooms. He said the company’s vision for a rebuild is between 155 and 170 rooms, although the RUE, as negotiated under a previous owner allows for 250. Why no mention of the Bellevue village issues. Some of the employees, in particular to hostess in the dining room at breakfast always acted disgruntled. She obviously did not enjoy her job. I hope she found somewhere else to work. I always dreaded breakfast. I found the bar and wait staff to be the worst part of Caneel. I love the place and have been 3 times, however these employees seemed to dislike the guests. We would have spent much more money at the bar had the bartender been even somewhat friendly and attentive.